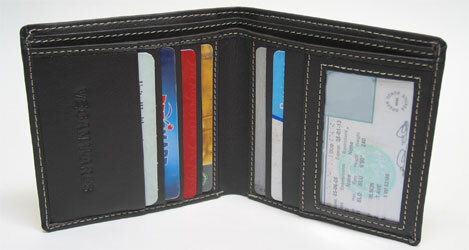 The perfect wallet for those who want a thin design that won't bulk up your pocket, this style offers plenty of space with it's clear driver's license window, 9 card holders, and 2 bill sections. Clean full-grain leather appearance combined with unparalleled quality from VeganWares makes this a wallet you'll be using for years. Measures 4-1/2"x4" folded. Available in Black or Dark Brown. $49.99 each. From Bob of Fort Werth, Texas on 1/30/2011 . you help me big help time! From Anonymous of Tucson, Arizona on 10/24/2009 . Great wallet! Fits nice, holds everything very well, and you're not carrying around your cash in the skin of a dead animal! From Brie Schwartz of Washington, District of Columbia on 9/4/2009 . From Tom F. of Cincinnati, Ohio on 10/4/2008 . Four years now, and it's still almost like new. From Ravi of Chicago, Illinois on 2/27/2008 . I've had this product for nearly three years, and it still looks and functions great! Love this product!